1. Dry-toast the fennel and coriander seeds in a frying pan for about 1 minute until fragrant. Set aside to cool slightly, then roughly crush in a pestle and mortar. Meanwhile, dry-toast the sunflower and pumpkin seeds for 1-2 minutes until golden; remove and set aside. 2. Using a vegetable peeler or mandoline, carefully pare long ribbons from the carrots and courgette (discard or snack on any leftover pieces). Place in a large bowl with the vinegar, crushed fennel and coriander seeds, sultanas and 100ml ice-cold water, then set aside. 3. Meanwhile, dry-fry the halloumi slices in the frying pan over a medium-high heat for 1-2 minutes on each side, until golden, then remove and chop into chunks. Drain the carrot, courgette and sultanas in a sieve, shaking off any excess, and discard the liquid. 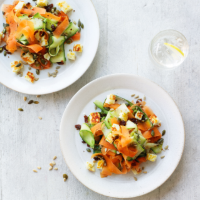 Place on 2 plates and top with the warm halloumi before scattering over the sunflower and pumpkin seeds. The quick-pickled carrot is lovely and crisp, and has a sharp kick to contrast with the saltiness of the cheese. This recipe appeared within the July 2018 recipe card collection.